Two disclosures from the outset: I’m easily suggestible, so suspense movies (and horror) are generally not my thing. I get way too invested in the storyline and get too freaked out. Disclosure number 2 and, perhaps equally important for this film, is the fact that I work as a 911 dispatcher. While the agency I work at is hardly at the LAPD’s level, there is enough enough emotional crossover at least that, combined with disclosure 1, this move really got to me. stakes need to continue to be ramped up throughout, and this film delivers in spades as the darker the plot gets the more you’re drawn into the pain and fear the characters experience. And, while the film does walk the line of over-the-top, it never quite crosses that line. 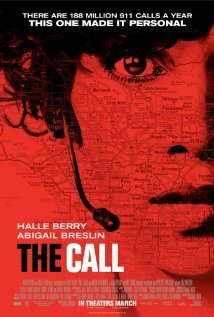 Halle Berry is excellent as the dispatcher on the edge. While she spends the bulk of the movie essentially staring at the camera monologuing into a headset, she infuses every scene with power. Every emotion is boiling just barely under the surface. She truly is a joy to watch. Where Berry’s dispatcher character has an emotional arc throughout the film, Abigail Breslin’s kidnap victim basically goes from 0-100 emotionally in the span of a few moments- and holds that level for 2 hours. Breslin has grown so much as an actress since “Little Miss Sunshine” that it’s hard to connect them as the same person and in this role she’s just a raw nerve for a large percentage of the movie and she never lets up. She doesn’t draw you in- there’s nothing subtle- she grabs your collar and yanks you into her world. For my money, this movie is Breslin’s from her first scene. All that said, this film is not without its problems. Michael Imperioli and Morris Chestnut are wasted in this story that they only have a fringe involvement with. While their characters- a good Samaritan/innocent bystander and the lead cop respectively- are necessary to the story, both characters are- rightfully- underused and it was a waste of 2 talented actors (not to mention the fabulous Roma Maffia as the dispatch supervisor). Secondly, Berry’s crew of trainee dispatchers, or the “voice of the audience” characters, asked questions that maybe those without dispatch/law enforcement experience would have, but in the guise of trainees into this profession their dialogue was almost insultingly naive and would have been better served by dialogue within the story. But, the biggest flaw this film has is its entire final act. Without spoiling, this is when the film skirts for too close to the line of implausibility. And, while I’m certain similar situations have occurred in reality, there are so many inconsistencies especially when it comes to established character and logic that the movie briefly fell apart for me. It does redeem itself (in a way) in the closing minutes but I found myself so befuddled by the direction change, not to mention the increasingly muddled (yet full-on horrifying) motives of our antagonist, that I was completely taken out of the movie. Nice to read a review from a fellow dispatcher! I’ll have to check it out.